This is a stylish 3 Piece Muhle Shaving Set featuring a Plum Wood Shaving Brush and matching Razor. Muhle place great significance on superior engineering and on the ergonomically designed properties of their sets, naturally this set is highly pleasing on the eye. This Shaving Set contains a Muhle Pure Badger Hair Shaving Brush, a Mach3 razor and a chrome plated Stand. Mach3 razors are known for delivering a close yet comfortable shave. Get up to 150 shaves from one Gillette blade by using a RazorPit Blade Sharpener. Plum wood is a hard wood with a beautiful grain, often used in the manufacture of musical instruments. The wood has been treated to make it waterproof. Nothing beats the luxurious feeling of applying lather with a quality badger hair shaving brush. Muhle Mach3: This razor uses the new generation of Gillette Mach3 Cartridge Blades. using thinner, finer blades with Gillette's most advanced low resistance coating. The Stand: The highly polished, chrome plated metal stand is perfect for allowing the brush to drip dry and aerate naturally - thus prolonging its life. It also keeps the razor off work surfaces - a hygiene plus. 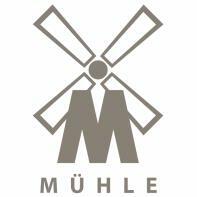 Muhle has developed a unique process for binding plastic to metal, the rings for holding the razor and brush are lined with plastic to ensure a firm grip and to ensure the brush and razor don't get scratched when put on the stand. It's all in the detail with German design and manufacturing! A stunning set that will provide years of shaving enjoyment.